We saved the best for last in our final Behind The Scenes Beauty video starring Cat McNeil and her namesake Lou, for Documentary Beauty 003. When Kayla and I were casting for Spirit Animal and discussing who would be as majestic as the animals that inspired us, I said, “you know who I’ve always said is my supermodel spirit animal, Catherine McNeil. At that moment it all clicked and I just knew it had to be Catherine. My first time working with Cat we talked about how crazy it is how sometimes peoples names can literally describe their features or personalities. I told her a story about a similar conversation I had with Crystal Renn, another otherwordly beauty and muse, and how she loves crystals, and connects so deeply with the energy of crystals, which makes her name so perfect. As I was talking to Cat about how perfect her face is for beauty, her look is so mysterious and feline-esque, she said “I even look like a cat!” After that shoot I always said in a humorous way that when It comes to beauty and just being a rad person in general Cat McNeil is my spirit animal! Now finding our actual spirit animal was another thing all together. Kayla and I were both hesitant to use a wild cat wild and were concerned about quality of life in captivity, it went against the very heart of our concept, of being free and respecting the spirit of the animals we so admired. So we decided to go with Katie Burnett’s house cat Lou! Lol. I like to call Katie's house the Bushwick Cat Sanctuary. Lou is named after Lou Reed because she is one of the more vocal cats at the sanctuary. I’ve never seen anyone love her cats so much besides maybe Kayla and her two cats Blue Bear and Zion, so I knew Lou was living her best life in Bushwick. For Cat’s eye makeup I wanted to accentuate her eye shape without changing the shape entirely. I used Bioderma Micellar water to cleanse the skin, followed by Embryolisse Lait-Crèam Concentrate for moisture and Marc Jacobs Undercover Perfecting Coconut Primer, applied with the Chanel synthetic foundation brush. For Foundation I used Koh Gen Do Moisture Foundation #112, using the same Chanel synthetic brush for her skincare. Below the cheekbones I used MAC Taupe Blush applied with the Chanel blush brush. I pressed Marc Jacobs Dew Drops Coconut Gel Highlighter into the top of her cheekbones with my fingers. For the Cat's Eyes I used Makeup Forever Aqua Black Cream Liner applied with MAC Eyeliner Brush #209. On the water line I used MAC Eye Kohl in Fascinating to really enhance the whites of her eyes along the water line. For Brows I used the Anastasia Beverly Hills Eyebrow Powder in Taupe, applied with the MAC #266 Eye Liner Brush and the Anastasia Beverly Hills Clear Brow Gel. I curled cats lashes with the classic Shu Uemura Lash Curler, and finished with the Loreal Voluminous Mascara in Black. For lips I used Smith's rosebud salve applied with the MAC #242 brush. 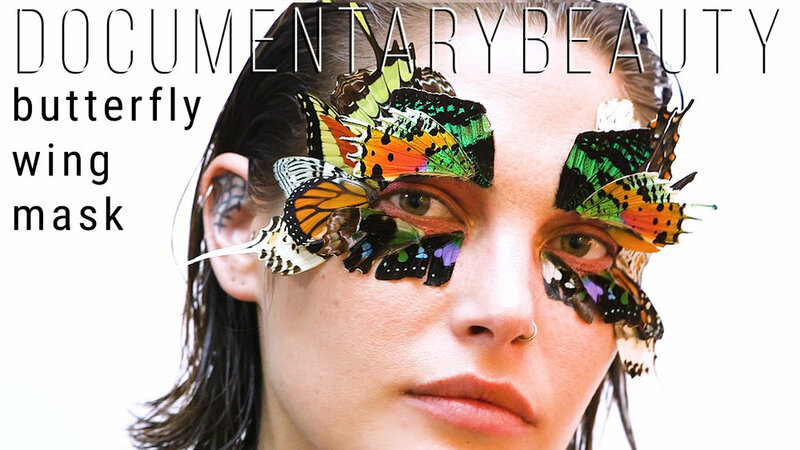 I hope you enjoyed our Documentary Beauty 003 Cover story Starring Cat McNeil as Spirit Animal. This story was particularly close to our hearts, and a dream come true watching these images come to life. Being able to capture the animals along side one of my all time favorite beauties and muses was one of the more memorable experiences of my career!